How an electrical circuit can imitate processes of perception can be particularly well illustrated using optical illusions, i.e. images that convey contradictory information to our perception. 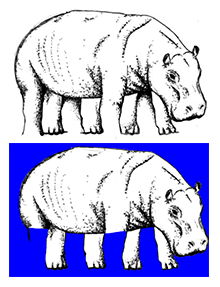 An example: at first glance, a drawing shows a normal hippo. If you look closer, you see that something is wrong. Some of the hippo’s legs are drawn so that they can neither be clearly assigned to the animal’s body, nor to the background. An optical illusion like this provides so-called "competing information", which is initially confusing for our brain. On this basis, it is simple to follow how our brain connects pieces of information. "It is quite difficult for people to recognise errors in optical illusions," explained private lecturer Dr Martin Ziegler from the Nanoelectronics working group at the Faculty of Engineering. "In general, our brain automatically creates a correct picture - in this case, the complete hippo. Because we need meaningful information to be able to make decisions quickly." The key to perceiving both interpretations of the image is concentration. It is one of the central principles our brain works by. Because what we focus our perception on, shapes our image of reality. To clarify this, the Kiel research team coloured the background of the drawing dark. This way they direct your attention to the legs of the hippo in the foreground, making it easier to recognise the incorrectly-drawn feet. With such perception processes, the frequency with which we identify specific patterns also plays a role: "If I look at the legs of the hippo a hundred times, and only ten times at the background, it is more likely that I will recognise a picture of a complete hippo," explained Marina Ignatov, a doctoral researcher in the Nanoelectronics working group. Why can we perceive objects? Behind the interest of research in optical illusions lies a central neuroscientific issue, which is also referred to as the “binding problem”: how does our brain construct a uniform perception from a variety of sensory impressions, and thus recognise objects, for example? Electrical impulses constantly transmit information between neurons in the brain, where there are respective independent networks responsible for vision, sound or touch, for example. In order to consciously perceive things, different areas of the brain must exchange information and re-link themselves again and again. For this purpose, the activity of neurons is synchronised - i.e. they work in step with each other. This can be seen in people by measuring the electrical activity in the brain (an EEG). "Synchronicity is already recognised as a functional principle of the brain. But we do not yet know how our brain connects its various areas, and thereby constantly changes its sub-networks," explained Professor Hermann Kohlstedt, head of the Nanoelectronics working group. It is believed that factors such as concentration, which we focus on certain objects in our area of perception, lead to information being linked. In order to understand which processes take place during the linking of information, the Kiel research team developed an electronic circuit made of oscillators. This circuit generates periodic voltage pulses in real time, and thereby works similarly to neurons in the brain. The researchers used special nanoelectronic components to link and synchronise the oscillators. These components are known as "memristors" (from the words "memory" and "resistor"). They are able to store electrical states, similar to the processes in the brain which occur during the linking of information. "The frequency of the electrical pulses which we subject the memristors to is thereby comparable with concentration in the human perception process. The higher the number of pulses, the higher the probability that there is a connection between the artificial neurons," explained Mirko Hansen, a doctoral researcher in the Nanoelectronics working group, and co-author of the publication. The intensity of these connections can be controlled via the memristors. This changes the connections in the electronic network, similar to the constantly adapting synapses between the sub-networks in the brain. 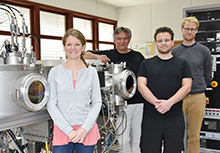 The work originated within the national collaborative research project "Memristive devices for neuronal systems" (Research Group 2093), which is funded by the German Research Foundation (DFG). Here, scientists from the fields of physics, electrical engineering, materials science and medicine work together. "Our long-term goal is to simulate higher brain functions which form so-called cognitive, electronic systems. These can be self-learning systems, for example, which - in the distant future - can maybe even develop something like empathy," said Professor Hermann Kohlstedt, spokesperson for Research Group 2093. 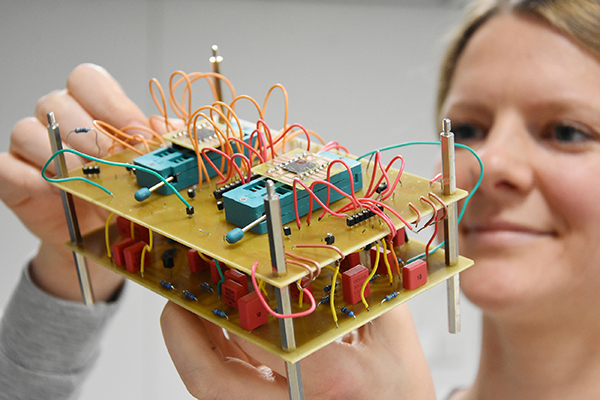 Marina Ignatov, a doctoral researcher in electrical engineering and lead author of the publication, shows an electronic circuit with which the perception processes of the human brain can be imitated. Electrical oscillators assume the function of the neurons. Memristive components are able to store electrical states, and to simulate synapses in the brain which link the nerve cells together. With this equipment, Marina Ignatov, Hermann Kohlstedt, Mirko Hansen and Martin Ziegler from the Nanoelectronics working group manufacture the memristive components at the Faculty of Engineering. The memristive components are manufactured on thin silicon discs, so-called wafers. 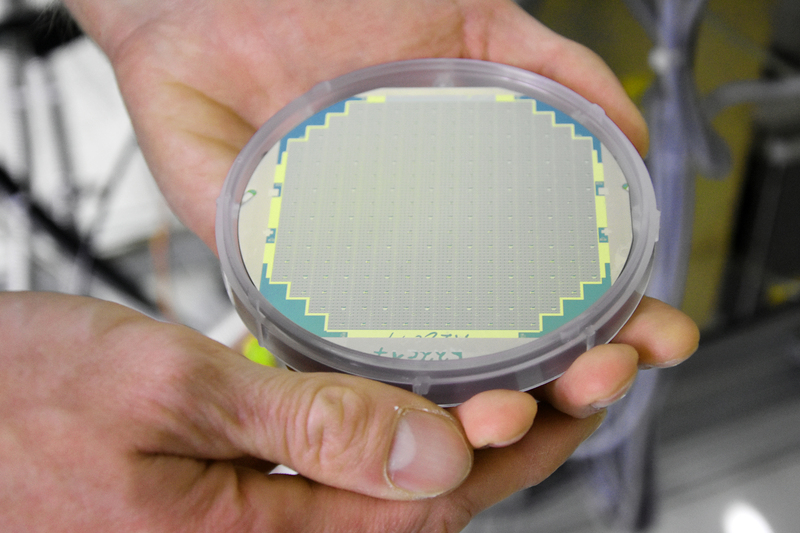 A total of 40,000 memristive components are located on one wafer, which consists of layers of silver, titanium oxide and aluminium, and is able to store electrical states. A normal hippo - or are the legs missing? Optical illusions like this one convey conflicting information. The Kiel research team uses them to show how our brain connects information.